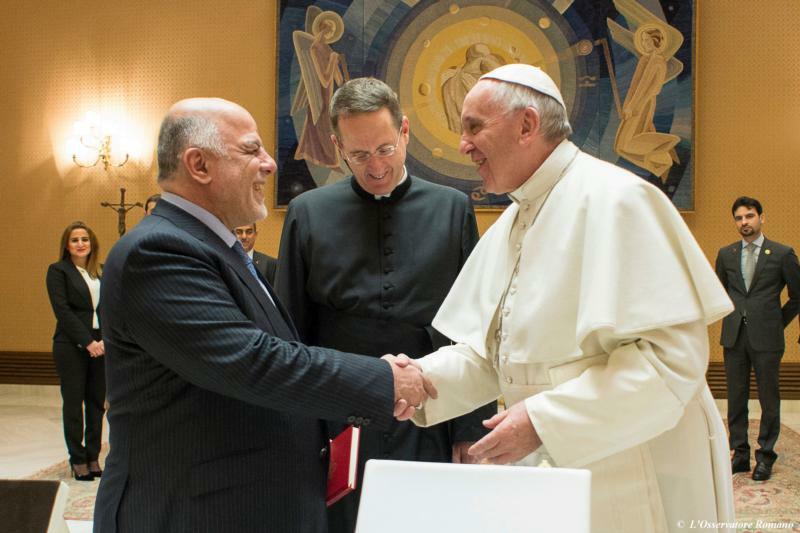 VATICAN CITY (CNS) — Meeting Iraqi Prime Minister Haider al-Abadi, Pope Francis expressed his hopes that Iraq and other war-torn countries would have leaders strong enough to bring once-divided peoples together. “I wish for Iraqis and for all of us — for the whole world — leaders like this,” the pope said Feb. 10 as he gave the Iraqi leader a medallion featuring an olive tree — a sign of peace — that holds together a split rock. In addition to meeting Pope Francis, the prime minister held private talks with top officials of the Vatican Secretariat of State. With Islamic State militants still operating in large areas of Iraq and with the people still recovering from war, the discussions included “the life of the church in the country” and “the situation of Christians and ethnic and religious minorities with particular reference to the importance of their presence and the need to protect their rights,” the Vatican said in a statement.